The beach is one of tourism icons in the city of Ambon. Pantai Pintu Kota is a beach that located in the village of Air Louw, District Nusaniwe, Ambon, Maluku. The beach is slightly different than most beaches in the Maluku that has white sand, the beach is full of rocks. 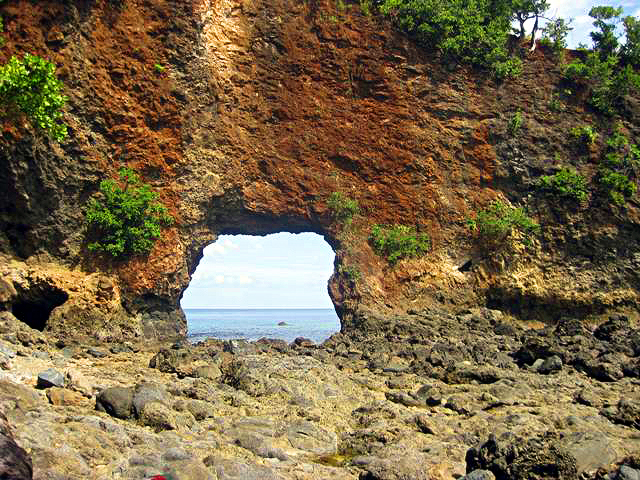 The uniqueness is comes from the huge hole in the coral cliff that penetrate on both sides. In this place you can also trekking to the top of this cliff cavities to sea Banda Sea in the distance. Pantai Pintu Kota or literally means the city gate beach is located in the Hamlet Airlouw, District Nusaniwe, Ambon, Maluku province. The distance is about 45 minutes drive from downtown Ambon. This beach is one of the beaches that quite popular for tourists for both domestic and foreign that comes to Ambon. This beach has beautiful view with the kind of rocky and stony beach. At this place, there is a cliff that juts into the sea and hollow. The hole is uniquely shaped like a gate. The cliff with a hole-shaped gate is becomes the icon of this beach. This beach is not too extensive, where most of the area is filled with coral and rocks. Some are stretching the pure white sandy beach with small boats docked as a background. The beach is often used as a shooting location and dive site spot because it has underwater scenery with stunning view. Some spots for snorkeling or diving are also in this coastal region and we have to reach the spots by using speedboats / boats that belong to local fishermen. The coastal area is already providing parking area with spacious and comfortable space. In the coastal area there are several huts that can be used for rest and shelter for enjoying the beauty of the beach. There are some food sellers, as well as home stays or inns are also available around this beach area. The access road to the beach location is smoothly paved and It takes only about 45 minutes from downtown Ambon. You can use private vehicles or public transport to get to the location. When using a private vehicle, you can go directly to the Village Airlouw because the access road has been smooth for car or motorcycles. When using public transport; from downtown Ambon, you can use the public transportation with red colored that leading to the village Airlouw (the public transportation is characterized by the sign of Air Louw that written on the roof of the car). The fare is around Rp.3,000 one-way. All times are GMT +8. The time now is 00:15.